Earl Grey Editing is owned and run by Elizabeth Fitzgerald. 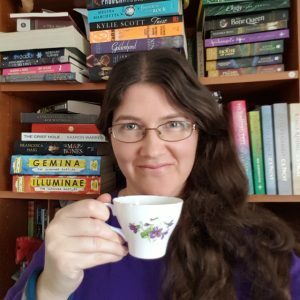 As a freelance editor since 2004, she has worked with a wide variety of forms ranging from epic poetry and fantasy novels through to research proposals and university theses. Elizabeth graduated from the University of Canberra in 2008 with a Bachelor of Communications (Honours) and majored in Creative Writing and Literary Studies. She has been a committee member of the CSfG for a number of years, serving as Secretary in 2011, 2012, 2015 & 2016. She also previously ran their novel critiquing circle. Earl Grey Editing’s blog was nominated for a Ditmar Award for Best Fan Publication in Any Medium in 2017 & 2018 and Elizabeth was nominated for Best Fan Writer in 2018. She was an Aurealis Awards judge in 2016 & 2018, and also reviews for The Skiffy and Fanty Show. She has a weakness for books, loose-leaf tea and silly dogs. Below are some of her credits as an author and you can also view her editing portfolio. “Phoenix Down”, Next, CSFG Publishing, April 2013 (Available in print or electronic format).